I checked out Long Trail Brewing's Limbo IPA recently as part of a Brewery Direct shipment to Florida Total Wine stores. 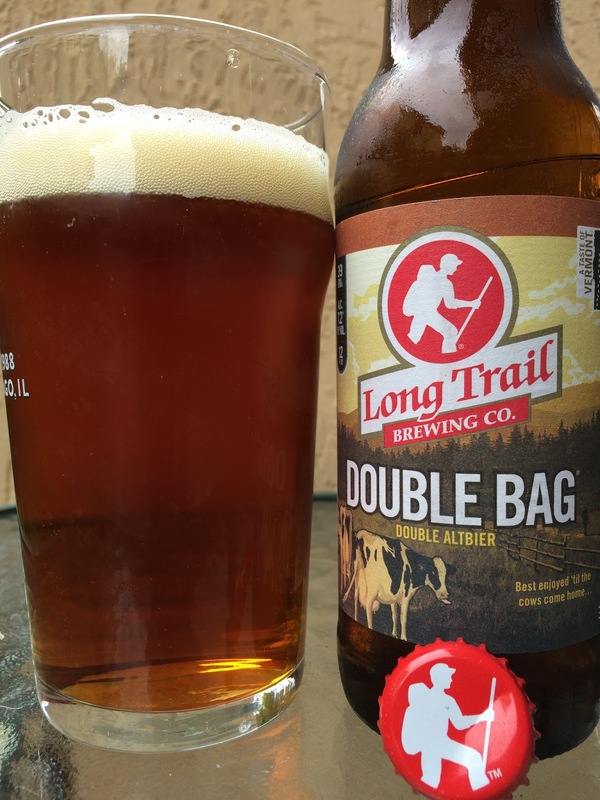 That beer was terrific, so I decided to try their Double Bag Double Altbier next. The label shows two cows on a farm in front of a mountain scene. I'm guessing their totally full udders might be the "Double Bags" from the beer name. Not sure. Bottled On 1/15/16. 39 IBU 7.2% alcohol. "Best enjoyed 'til the cows come home..."
Malty, herbal, caramel aroma. Similar flavors full of sweet caramel and herbal tea. Tons of buttery toasted bread follow, even that brown bread. Creamy texture. There is a tangy orange bitter thing going on at the finish too. Very interesting and different. Of the 4 great beers we tasted today, my wife decided the rest of this bottle was hers! Winner! Check it out!